There are many tools and softwares out there to facilitate the organization of your photos or pictures. Some tools just put too much of the complexity that the main purpose of organization fails. What everybody needs is a folder! A folder with its name and pictures. 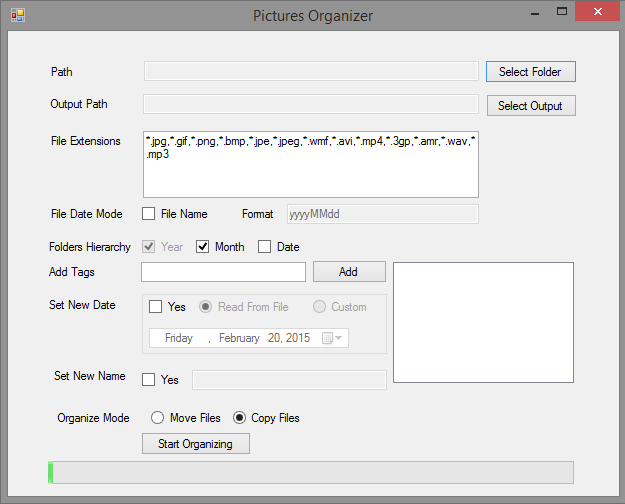 This simple desktop utility takes your pictures from a folder, traverses all child folders and copies or moves all the pictures in them to a structure of folders organized in years, months and dates. Simple! Further you can select how much deep you want to go in this hierarchy. For example you can select only Year -> Month and it will save all pictures of a month in a folder no child folders for date by organization. There is a little more sugar related to meta data. You can set the tags into the picture files about them. For example a trip name or the person’s name in a photo or image. That is pretty useful when searching back using any software which uses meta data. This utility has an option to select File Date Mode. Be default the date time information is copied from the meta data of the picture file for its place in the organized structure of folders, if you select File Name mode it will look for the pattern of date time within the file name. The pattern is specified next to the checkbox. This tool can also be used to correct the meta data of images. If you see wrong date time of the photos you can set the date time and copy or move the pictures with new data in them. ← How do I reinforce my faith in Islam?